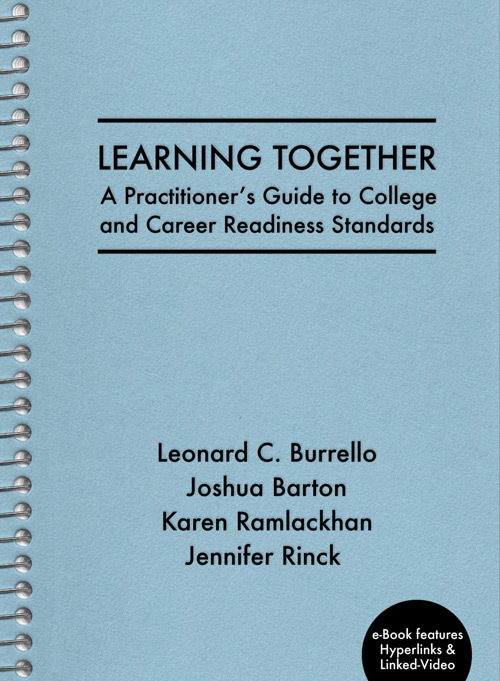 This e-book illustrates how a school district strategically planned for the implementation of the College and Career Readiness Standards, but more importantly, how teachers now teach and how students now learn. This e-book can serve as a training guide for teachers and district teams. We priced the e-book affordably for schools wanting to provide district wide CCRS's professional development. The e-format allows for easy access in the classroom, at home, or during in-service for the first-year or twenty-year teaching professional beginning their Common Core transition. The multimedia format is three guides in one - a digital onion. The text, hyperlinks, and linked videos displayed on our password-protected Vimeo channel peel back to reveal more resources. We've cherry-picked high-value resources specific to delivering instruction and planning. The appendix contains documents districts can adopt and modify for their own CCRS implementation. Exclusively from the Forum on Education & Elephant Rock. Our mission was to find teachers beginning to implement the CCRS. We wanted to document their teaching as well as their developing knowledge and skills. This led us to Pasco County, Florida. With the assistance of district leadership, we observed and interviewed six teachers. Each has a reflective essay included in the e-book. Chapter 1 takes on the fundamental CCRS shifts. Chapter 2 shows instructional strategies for teacher adoption. Chapter 3 discusses the teacher's role and student empowerment in assessment. Chapter 4 documents Pasco's district's strategic plan and implementation of professional development to support CCRS through the creation of professional learning communities. Chapter 5 summarizes research on evidence-based practices that support the CCRS instructional shifts and curricular modifications. Leonard C. Burrello, Professor and former Chair of Educational Leadership and Policy Studies and Chair of Adult, Career, and Higher Education, University of South Florida. Burrello is the author of six books and authored over fifty-seven articles and produced twenty-eight videos and DVD as the Executive Director of the Forum on Education . where is a Professor Emeritus. Joshua Barton is a doctoral candidate at the USF. His research interests include pre-service and in-service teacher training and licensure, national standards, and accountability. His particularly interested in inclusive service delivery systems and practices for students with disabilities, collaborative teaching and multitiered systems of support. Karen Ramlackhan, a doctoral student in Educational Leadership and Policy Studies at the University of South Florida. Her current research focuses on issues of equity, social justice, and inclusive education for marginalized populations. Jennifer Rinck has served as a special education teacher, instructional coach, professional development specialist, and school improvement consultant. She is currently completing a PhD in Educational Leadership and Policy Studies. "A very valuable resource for educators. The teacher interviews are extremely powerful, and the videos provide teachers to see what instruction aligned to Common Core can look like in the classroom. Pasco is a great example of intentional, thoughtful systemic change. Thank you for sharing this wonderful model!" Here is a sample linked-video clip from chapter 2. This Strategic Instruction video clip, featuring third grade teacher Kim Beck, is one of twenty-two linked-videos featured on the e-book. Note: large orders for training purposes will have to be downloaded individually to each device. The ebooks are non-transferable. Contact our production partner with questions:[email protected].